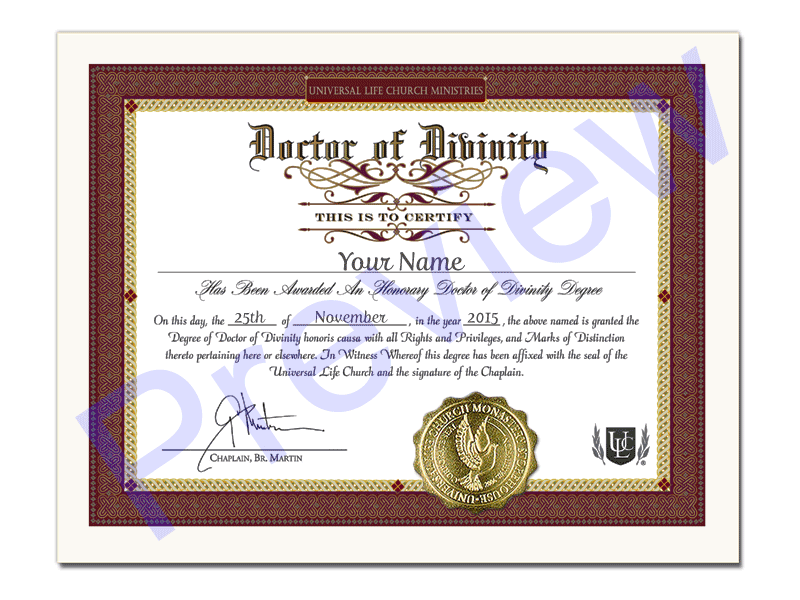 Order a hand lettered certificate commemorating your self guided completion of study in the field of divinity. Includes degree and Guide to Divinity booklet. Do you feel your ministry is calling you to the next step? You can obtain the Doctor of Divinity Degree through the Universal Life Church. When you order this custom 8.5" x 11" frameable certificate, we send it out to be hand-lettered in beautiful calligraphy by our church scribe. It is printed on high quality paper, with a standard frame sizing and features the gold church seal. The date issued on the degree will be the date it is ordered, not the ordination date. Degrees requires 2 weeks to create and will be shipped alone at a later date. FedEx shipping is not available for the degree, it will be shipped alone at a later date. International orders will be held until degree is ready before being shipped.